I'll have more to say about the conference I'm sure, but I wanted to make sure to both shout out and publicly admire Lorne Jaffe's great reading on Friday morning. Lorne makes no secret on his blog about his ongoing battle with depression and anxiety. The thing about Lorne is that in the 10 or so minutes that he spoke, he displayed more courage, bravery, honesty, vulnerability and gumption, then I may have ever seen before. And certainly then I think I have ever done. I have no problems speaking in front of people, and of telling my personal stories. It's my stock in trade as a clown, actor, and performer. But my personal stories are edited, and vetted, and are what I'm willing to let people see. I let people see the stuff that won't hurt me. The real me is somebody that I keep hidden, so he doesn't get hurt. I've been assuming that most people operate in this same way- at least until I met Lorne. As I remarked to several people afterwards, Lorne was more truthful and open and vulnerable than any actor could be-- primarily because exposing that much of your raw nerve and self is terrifying and brutal and hard, and no actor could do that 8 times a week. In fact, that's why actors have technique, so you don't go crazy when your son Tiny Tim dies 8 times a week (twice on Wednesdays and Sundays) for 80 performances. If you don't have technique, it's too much to bear. 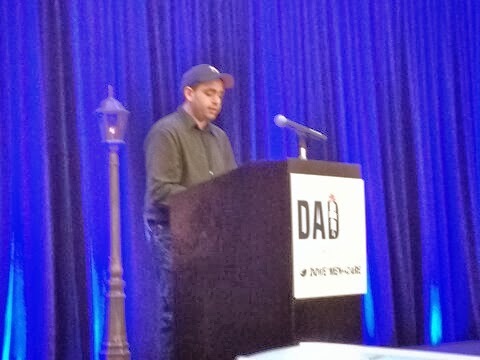 Lorne Jaffe speaking at Dad 2.0. It takes great amounts of courage to face down your fears and still do the thing that terrifies you. At the end of his speech, Lorne received a standing ovation. As we all stood, it was clear to me that Lorne thought that people were standing out of pity, or a sense of duty, or loyalty. I could see it in his confused eyes. We weren't standing for any of those things. We weren't even standing for his specific speech (although it was a great essay, and I recommend reading it) We were standing for Lorne and the incredible vulnerability and courage that standing on that stage represented, and that we recognized. And maybe envied a little. I don't envy Lorne his problems-- but I wish I had a little bit more of his courage. Maybe my writing would be more filled with essential truths and less with half witty observations. You nailed it, Adam. I stood because I understand how hard it was for him to overcome that fear and deliver that story. It was my reality last year at this very conference and I know that this is going to help his confidence going forward. I still get goosebumps thinking about it.